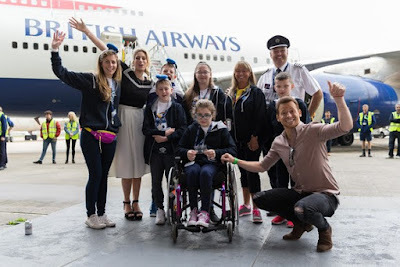 Hundreds of children got to meet X factor winner Stacey Soloman and former Eastender Joe Swash as they attended a supercharged send-off at Heathrow for Dreamflight 2017. Stacey and Joe chatted with the children before they jetted off on a British Airways jumbo jet destined for Orlando where the kids will visit Harry Potter World and swim with dolphins at SeaWorld. Every year Dreamflight raises funds to enable a specially chartered British Airways jumbo jet to fly almost 200 children with a serious illness or disability to Florida to enjoy a fun packed ten-day trip of a lifetime. There the youngsters will spend time at attractions including Walt Disney World, SeaWorld and Universal Studios. British Airways comes together with the Dreamflight team each year to make the departure an extra-special event. An army of volunteers, including Darth Vader, his Stormtroopers, the Air Cadet National Marching Band and British Airways cabin crew and pilots were at Heathrow to see the children board the Boeing 747 through a magical castle. Natasha Baker MBE and Liz Johnson, who both won Gold at the Rio 2016 Paralympics last year, travelled on the trip when they were younger and came back this year to celebrate Dreamflight’s 31st anniversary and share their stories with the children. Since the first flight in 1987, more than 5,600 children have flown on ‘Dreamflight’, and for many – it’s the very first time they’ve travelled abroad and been away without their family. The young fliers are accompanied by the Dreamflight team, British Airways cabin crew, and a fully trained medical team, which includes doctors, nurses and physiotherapists, on hand 24 hours a day throughout the trip. For more information on Dreamflight, please visit: www.dreamflight.org.